In a continuing effort to educate all comers, I share useful information I’ve learned, and conversely, offer myself up as a horrific, terrifying cautionary tale. So, this anecdote of mystery and invention would have been shared, regardless the outcome. I’ve previously written about the woefully underdeveloped and overly discriminating sweet tooth possessed by The Kid. There are only two items always on the child’s dessert list; red velvet cake, and buttery, sandy, not too sweet shortbread. I know from shortbread, and have a recipe my child loves. So, I decided to find a recipe for red velvet shortbread and make a batch for under the Christmas tree. There was only one problem. There was no recipe for red velvet shortbread—anywhere. As far as I can tell, it didn’t exist. So, I decided to invent it. And I had to work around some non-negotiable criteria, and some pretty complicated baking-related restrictions. Traditional shortbread is flour, butter, and a small amount of sugar. There are no eggs, no leavening, and no liquid other than a bit of extract. 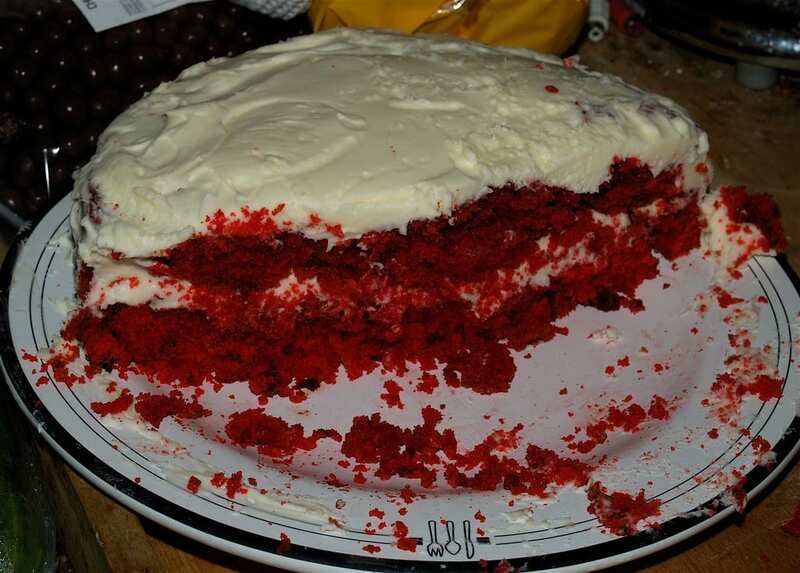 Red velvet is made with the afore-mentioned bottle of food coloring for color and buttermilk for tang. If I added these ingredients, it would be too wet and no longer shortbread. For color, I used a small amount of gel food coloring as well as Hershey’s dark cocoa. For acidic buttermilk, I substituted a bit of apple cider vinegar. I mixed, said a quick prayer to the baking gods, and slid it into the oven. When it came out, the burnished brick color had deepened to the familiar red velvet hue. After it cooled there was a taste/texture test. It had a mouth-feel like shortbread and seemed to taste like red velvet. I put it in a big jar with a pretty ribbon and waited for The Kid’s discerning palate and final verdict. Preheat oven to 275. Butter 9X13 baking pan, and line bottom and two sides with parchment paper, leaving enough to use as handles when removing shortbread from pan. Brown butter: Melt butter and cook until dark amber-brown and nutty-smelling. Allow to cool to softened-butter stage. Make sure to use all the browned bits—this is where the flavor is. Cream butter and sugar on medium speed until light, about 2 minutes. Add salt, vanilla, and red food coloring. Beat to combine. Add flour and cocoa, 1 cup at a time, beating until just combined. Press dough into prepared pan, smoothing top. Cut dough all the way through lengthwise into nine strips. Cut strips crosswise into four pieces for a total of 36 bars, or fingers. Then pierce each piece with five holes. Bake shortbread until color’s deepened and just set, 70-85 minutes. Sit pan on wire rack to cool completely. Turn shortbread out of pan, and carefully coax pieces apart with serrated knife. Store in airtight container. It was a Christmas miracle—The Kid loved it. And quickly informed me that I had to write a column about it. That was already the plan; no matter what. Thanks for your time.